Certificate of Entitlement (COE) premiums dipped across all categories (except for motorcycles) on Wednesday (Nov 21) in November second round of bidding. Category A (cars up to 1,600cc and 130bhp) COE dropped the most by 11.3% from $28,199 to $25,000. COE premium for Category B (cars above 1,600cc or 130bhp) closed at $31,101, down by 3.72% from $32,302. 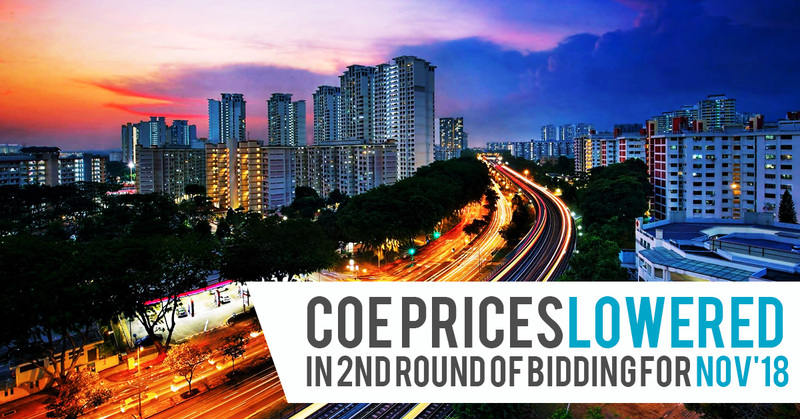 COE premium for Category C (goods vehicles and buses) dropped by 6.8% from $29,501 to $27,509. COE for Open Category (any vehicles except motorcycles) also dropped by 3.3% from $32,000 to $30,959. Only COE for motorcycles closed higher at $2,989 from $2,509. The higher quota of COEs for Category A compared with the previous quarter is one of the reasons for the fall in small cars premium price. In addition, the new vehicular emissions scheme (VES) introduced in July this year has also somewhat contributed in dampening the demand for new cars. According to the report in September by The Straits Times, only about 15% of new cars registered qualified for rebates under the new scheme. The dip in COE premium has resulted in a decrease in Prevailing Quota Premium (PQP) as well. Renewing your car is so much more affordable now compared to earlier this year. November PQP for Category A cars has been on a downward trend and currently reached this year’s lowest at $27,571, for Category B is now $31,553 and for Category C, it is $28,187. If your car’s COE is expiring soon and you have yet to decide on a new car model, why not consider extending your current car while you continue to look out for the best option? Call us at 6444 4400 to find out more about getting a 100% COE renewal loan today.